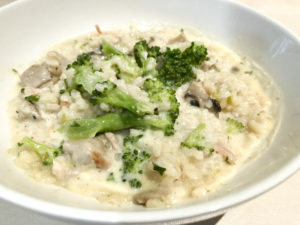 This is not my usual Risotto recipe, it’s made with what I had on hand in the fridge and the cupboard. It’s a fast enough, lazy “I’m not going to the shops today, no matter what” kind of throw together. It worked well and made enough to feed 4 hungry people, so I thought I’d record the results. This is heavily based on my regular more fussy version, but with what was on hand and with some shortcuts. I found the shortcuts I took didn’t adversely affect the end result. I would usually have parmesan, porcini and snow peas, but this recipe really didn’t need it. Most of the vegetables can be switched out in this recipe. Same goes for the cheese. If using parmesan just cut the amount down added. 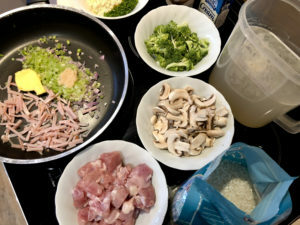 The method below is my lazy way of doing things… I would also usually pre-cook the chicken and add it at the end to prevent it drying out, but using chicken thigh makes it unnecessary, the chicken was flavoursome and tender as it cooks through quite gently despite simmering in the risotto for around 20 minutes. This is not traditional risotto, There are some techniques in here that are great though. My family likes this version as much as my regular one, so I’m calling it a win and keeping this to use in my rotation of regular recipes. It doesn’t matter if the stock cools down again it doesn’t affect the risotto making process much using cold stock, it just adds a couple of minutes. Very finely dice the shallot, the celery, and the spring onion. Finely chop the parsley. Finely slice the mushrooms, and break up the head of broccoli into very small florets. Cut the bacon into very fine shreds. Cube the chicken thighs into roughly 2cm cubes. 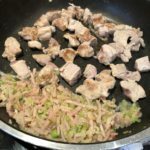 In a large, deep frypan begin to fry off the spring onion, shallot, celery, garlic, butter, and bacon. Once the pan is quite hot move the bacon, onion mix to one side, and begin to fry off the chicken cubes. Try to only turn the chicken cubes once, leave them on one side until it browns then turn over to brown the other side, the middle should still be pink and undercooked at this stage as it cooks through later while making the risotto. 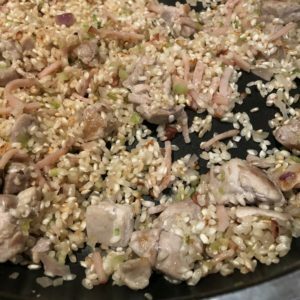 Pour in the rice into the pan with the chicken, onions, and bacon and mix it around. Toast off the rice for a few minutes, mixing and stirring a couple of times to toast off the rice fairly evenly, The aim is to get a good amount of the rice to a very light, nutty, toasted, golden colour. Deglaze the pan by pouring in the wine. Allow the wine to cook off before pouring in 1 cup of stock. Cook down the stock, stirring regularly to prevent the rice from sticking and ensuring the risotto cooks evenly. Add another cup of stock and the mushrooms. Cook the stock down stirring regularly. Continue adding stock, half a cup at a time and cooking it down, stirring regularly until the rice is just cooked, still firm but no longer chalky in the middle. Drop in the broccoli florets and add another cup of stock. By the time the stock reduces the rice and broccoli should be perfectly cooked, the texture of the sauce should be gravy-like once again. Add several very generous coarse grinds of black pepper, pour in the cream, mix it through and allow to warm up again for about a minute, then take off the heat. The cream will loosen the risotto up to the right consistency. Fold in the cheese and parsley then pour into bowls and eat. If you’re feeling especially fancy sprinkle some extra parsley on top. all on your spoon, it should flow like a thick gravy. Poured into a bowl it should take on the shape of the bowl, not pile in the middle. The rice should be plump and not mushy; it should have some resistance when bitten into, but not be chewy and definitely not chalky in the middle.